Austin BLEDSOE was the son of Isaac R. BLEDSOE and Milly (Unknown). He was born 7 April 1833 in Scott County, Virginia. He died 20 March 1915 and is buried in the cemetery that bears his name. He married Elizabeth ROBINETTE on 7 January 1857 in Scott County, Virginia. She was the daughter of Jesse ROBINETTE and Susan ROBERTS. Austin was a brother to Andrew BLEDSOE, the father of Hiram BLEDSOE. 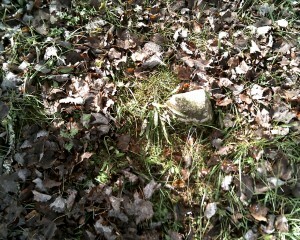 Below are the headstones or grave sites for some of my family members. 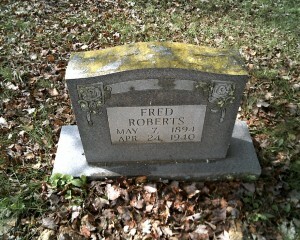 My oldest great aunt, Hettie (Roberts) Nickels and her husband are buried between my grandfather and great uncle Sug. But there are no markers for their graves. 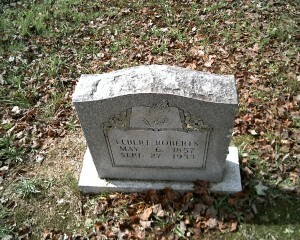 It is believed that her sister, Ada P. “Addie” Roberts, who died in 1914 at age 21, is also buried there. 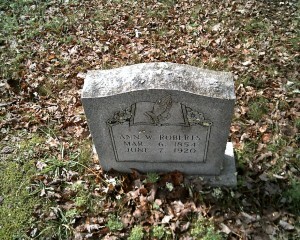 Since there was no space left next to my grandfather for my grandmother, Esta Mae (Wallen) Roberts, she is buried next to her father in the Baker Cemetery in Kyles Ford, TN. I have a page for that cemetery on this site. According to my uncle Paul Roberts, who helped dig one of the graves, and Governor Russell, who helped dig all of the graves, the headstones are not placed correctly. This is due to them being placed in recent years by family members. The graves are located near a large tree next to the fence on the lefthand side as you enter the cemetery. Starting at the fence, the order is Bascum Roberts, Ann Roberts, Elbert Roberts, Fred Roberts, Hettie Nickels’ husband, Hettie Nickels(Fred’s oldest sister), and “Sug” Roberts. My great grandparents had 5 children that died while infants or children. 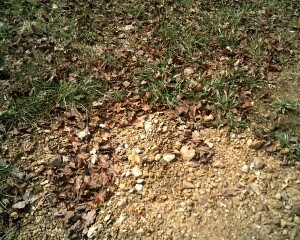 It is believed that they are also buried in the Austin Bledsoe Cemetery with only rocks to mark their graves. They also had 3 other daughters, Effie (Roberts) Stout, Virgie (Roberts) Morgan, Wortie (Roberts) Gregory, and Ann (Roberts) Quillen, who moved to TN, NC, and SC and are buried in those states. They are included in my “Family Buried Abroad” page. I loved your website and met your relative at the gas station several years ago. I was visiting the McPherson’s. My great grandmother was Francis Roberts, she married Harvey Clinton Wygal. They had three children Elbert Hagen Wygal, Elizabeth Wygal (Lizzie) and Lula Mae Wygal. I can not seem to get too far back. I think her father was John Roberts and then there seems to be a James. Can you help me? ~First of all, thank you for this website. Love it. ~Hoping – perhaps you and / or your site-visitors may be able to provide me with information regarding my family history. ~my GreatGrandMother was Darlie Rose Bledsoe – married William Noel Berry. Had Ida, Ona, Lettie (Letia), Myrtle, James. Ida became a nurse, Ona and James became teachers. If this helps make any connections – I am the daughter of Lee Byron Brown Byrd, who was daughter of Ona Lee Berry Brown who was daughter of Darlie Rose Bledsoe Berry – which should tie up with some Robinettes, I am told. We were born and raised in Whitmire, S.C. and all of my relatives worked at JP Steves there. None were rich as they set out to be. My parents lived there until their deaths in 2005 and 2007. My brother still lives in Whitmire. There are a lot Willis people buried in Cemetery off Hwy. 604, Blackwater,Va. go past old Blackwater High School , beyond old Robinetee;s Store, is on left down Bledsoe Ln. also in Osborne Cemetery, behind Old High School,I am John S. Osborne, Grandson of Dr. Andrew J. Osborne…. John – my grandfather was Everette E. Willis. His mother was Martha A. Osborne, sister of Dr. Andrew J. Osborne. She married A. J. Willis (Andrew Jackson Willis). Do you happen to have information pertaining to Martha and A. J.? John, my grandmother Della is Doc Andy’s niece. Just curious if im related to anybody here in this cemetery? My father’s Great Grand Father’s were Isaac Bledsoe and Elisha WAllen. I’m from Whitmire South Carolina. My father Roy (Jack)Jackson Bledsoe was born in Virgina. Darnell, I’m from Whitmire, S.C. as well. I went to High School with Ike and Eddie Bledsoe. I am really trying to find my great grandparents for my granddad, Samuel Henry Willis. 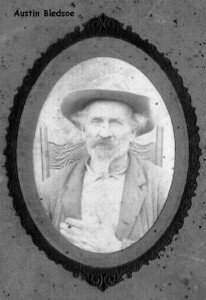 My great-great-grandfather was Andrew Bledsoe, brother to Austin Bledsoe. Their daughter, Minerva Bledsoe 1847-1910, married Thomas Lawson. They were my great-grandparents. Thank you for your informative website. We’re hoping to visit the cemetery to pay our respects. I’m most interested in Hettie Roberts Nickell and her husband A C Nickell (Nickel). I found an index of their marriage record online for 15 Sep 1913 for Lee Co, Virgina. His birth date is listed as 1872 with parents noted as James K. and Elizabeth. I found a death certificate for Hettie Roberts Nickell dated 6 Jan 1951 but did not find similar for A C Nickell probably between 1913 and 1930 since 1930 census lists her as a widow. No census record found for them in 1920 so I don’t know if they had any children or if she was already a widow. Any guidance, clues, or photos are welcome.